It takes months—sometimes even years—of planning to create the 11 minutes of magic that each corps delivers at the World Championships. This three part series—published in the winter issue of Drum Corps International Magazine—goes behind the scenes to see how four top corps put the pieces together in the off-season to produce the programs fans will see performed on the football field this summer. Every year, each of Drum Corps International's member organizations faces the same challenge: Create a show that will capture the imagination of audiences, stand out against competing corps, and, ultimately, impress the judges enough to win a World Championship. It's an intricate puzzle involving music arranging, visual design, movement, costumes and story lines. 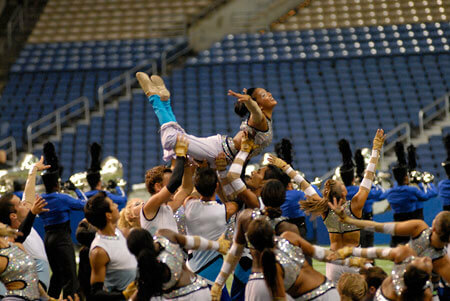 before corps like the Blue Devils can take flight with their yearly productions. It takes a while to assemble all the pieces: Some corps begin work almost immediately after the DCI Championships in August; others take more time to evaluate the past season before they start on the next. Some try to nail down their show as early in the season as possible; others keep some tricks up their sleeves to give the judges and fans a late-season thrill. We talked to the program leaders of the top four finishers at the 2007 DCI World Championships to learn how these elite groups design the pieces and fit them into place. For most corps, the making of a show begins while the previous season is still in full swing. "We spend a lot of time in a bus or an RV driving around the country," says longtime Cadets' director George Hopkins. "That lends itself to a lot of discussion about the next season." By the time Hopkins and his team get together to plan the new show, they've already got three or four program ideas to consider. The Design Meeting While every corps design team has their own individualized blueprint for building a show, most corps will begin with some type of design meeting as early as mid-September or late November. In most cases, about five people are involved—typically, the meeting is helmed by the corps' director or program coordinator and also includes the brass arranger, percussion arranger, drill writer, color guard designer, and perhaps a design consultant. The design meeting is the first formal step in the creation of a new show, though it may be preceded by a round of phone calls, conference calls, or e-mails tossing around music and visual ideas. Design meetings can sometimes involve a lot of back-and-forth, but ultimately, it's essential that the team walks out of the room agreeing on a single, clearly defined idea. Sometimes the theme for a new show has been simmering on the back burner for long time—as with this year's Cavaliers. Entering their 60th anniversary season, the Cavaliers wanted to do something special that would capture the essence of the corps. The answer was "Samurai." "That's something that's been on our list," says program coordinator Scott Koter. Koter's design team agreed prior to their October meeting that Samurai was a concept in harmony with the "fraternal part" of the Cavaliers, as well as the corps' sense of tradition and consistency. Design meetings can sometimes involve a lot of back-and-forth, but ultimately, it's essential that the team walks out of the room agreeing on a single, clearly defined idea. And, says David Gibbs, executive director of the 2007 World Champion Blue Devils, "We have to make sure the idea is the right one. We bash it around and make sure there are no holes in it. We make sure there's enough content for us to explore—and that the main people are excited. Everybody has to have a sense of buy-in." Dan Farrell, program director for Phantom Regiment, says his goal is "to come away with the selection of music as well as a kind of loose storyboard for the show." The Cavaliers also create a storyboard—a visual layout of the progression of events—to give them an overview of the show. "We get many ideas, visual and musical, and try to pare it down from there," says Koter. It's not always easy to reach a consensus when things get heated. "We'll discuss it, and if we can't come to an agreement, I'll make a decision and that's it, that's where we're going," Farrell says. Tomorrow: "Divide and Conquer"